1. Brush your tongue. 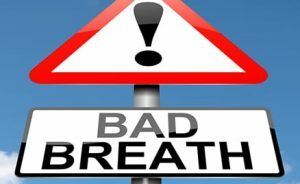 Bad breath is usually caused by lingering bacteria in your mouth. Brushing your tongue eliminates most of this bacteria. 2. Chew gum, but not just any gum. Make sure your gum is sugar-free and contains xylitol. 3. Avoid alcoholic drinks. Alcohol can lead to dehydration which leads to dry mouth which causes bad breath. If you are going to partake in alcohol, be sure to drink extra water throughout the night. 4. Brush and Floss. Eliminating plaque from your mouth will help rid bad breath as well. 5. Use an alcohol-free mouthwash. This is especially important for people that suffer from dry mouth.